Posted on November 10, 2018 by H. W.
While my current review of worldwide museum collections is geared towards an upcoming second manuscript on Shaligram interpretive traditions, it did also get me thinking about labels again. 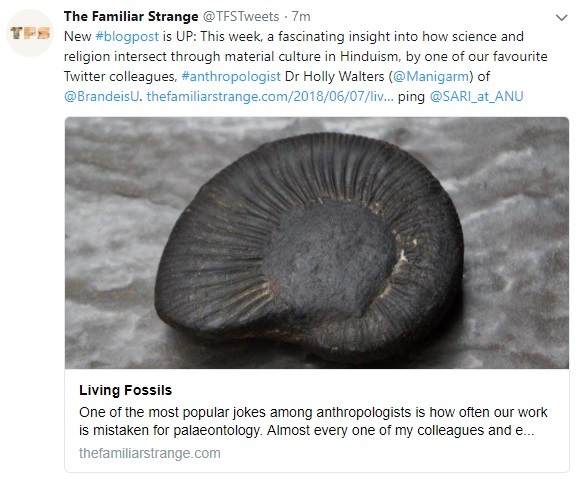 The vast majority of the Western world knows Shaligrams only by scientific categories and because of this, is largely ignorant of their meanings beyond that of a common index fossil (more suited to the backroom of a collection or to a souvenir shelf than much else). They are fossil ammonites, they are primarily found in Nepal and Tibet, they are produced by a geological formation known as the Spiti Shales, and they are comprised of roughly four species of extinct Jurassic shellfish: Blandifordiceras, Haplophylloceras, and Perisphinctids (including both Aulacosphinctus of the Upper Kimmeridgian/Lower Tithonian and Aulacosphinctoides of the Upper Tithonian). 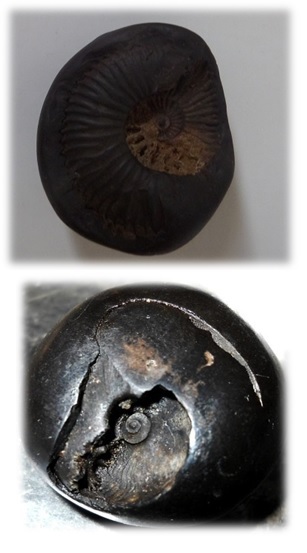 Other Shaligram formations include belemnites (such as the Ram Shaligram) and the bivalve Retroceramus (such as the Anirudda Shaligram) but for the most part, “classic” Shaligram manifestations are, by and large, comprised of various black shale ammonites that fit the aforementioned paleontological criteria. In other words, these categories have produced a specific kind of knowing about Shaligrams and about fossils in general that represents a particular perspective in the history of scientific knowledge production. The Swiss naturalist Conrad Gessner also included some ammonite illustrations is his work De rerum fossilium (1565), but even toward the end of the 17th century, it is especially interesting to note that the organic nature of ammonites remained under debate (a debate which takes places in the Hindu Scriptures as well – most notably in reference to the formative workings of the vajra kita, or the thunderbolt worm). Robert Hooke, the famed experimental scientist and nemesis of Sir Isaac Newton, was fascinated by the logarithmic coil of ammonite shells and their regularly arranged septa (recall the classic image of the golden ratio). It was he who reached the conclusion that ammonites were not only of organic origin but also widely resembled the nautilus and may therefore be related. However, it wasn’t until 1716 that ammonites would finally join scientific taxonomy with a classification scheme first recorded by another Swiss naturalist, Johann Jacob Scheuchzer. The modern form of the word ammonite was then coined by the French zoologist Jean Guillaume Bruguière in 1790, but it wasn’t until 1884 that the subclass Ammonoidea was finally formalized in modern zoological taxonomy (Romano 2014). In the Americas, Cretaceous baclitid ammonites were also once collected by the Indigenous peoples as “buffalo stones,” and were kept in medicine pouches as aids in corralling bison (Mayor 2005). Called Iniskim, members of the Blackfoot First Nations continue to harvest bright opalescent ammonites for ceremonial purposes even today. [iii] Furthermore, aside from their role as Shaligrams, ammonites also have a long and storied history more broadly in what Alexandra van der Geer refers to as the ‘fossil folklore’ of South Asia. She relates in detail, for example, entire regions of fossil beds containing not only ammonites but ancient giraffes, elephants, and tortoises near the Siwalik Hills of the Himalayas in India, which are used as evidence in proof of the great cosmic battle of Kurukshetra as described in the Mahabharata epic and which are also visited by religious pilgrims from all over the world (2008). Isn’t it surprising then, given the incredible history of ammonites beyond geologic categories, that this information, these labels, almost never make it into museum collections? I’ve never seen, for example, any such exhibit that displays fossils in this way, unless, of course, we start talking about religious museums. I have no doubt that the Creation Museum in Kentucky has its own take on the fossil record and one that, undoubtedly, stands in opposition to science; that makes claims to truth over evidence and only that which aligns with their particular interpretation of Biblical texts. 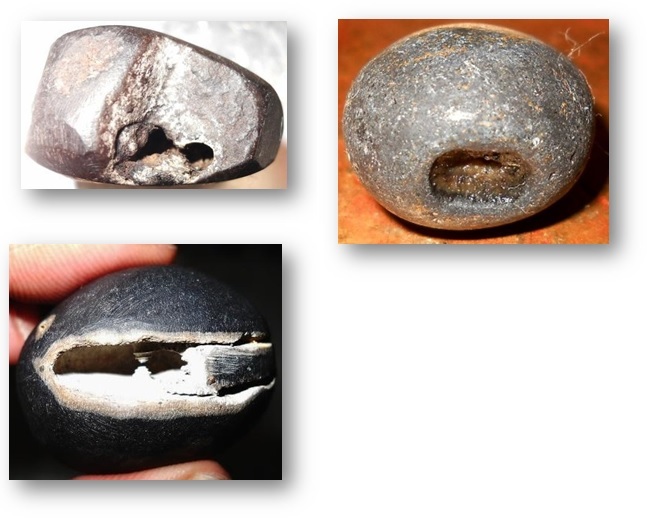 But like so many Shaligram practitioners, I do not mean to present Shaligrams here as any kind of potential foil to scientific inquiry or to imply, in any way, that the creation stories of Shaligrams are distinctly at odds with evolutionary theory. Because, for the most part, they aren’t (see: “Living Fossils” – https://thefamiliarstrange.com/2018/06/07/living-fossils/). And, in fact, I might argue that this division of modern museums and their preferred display narratives is more representative of the politics of religion and science in the West broadly than it is about what a Shaligram, or even an ammonite, “really” is. What I imagine then is the opportunity to design a museum exhibit that pays tribute to all kinds of ways of knowing; to blend the narratives of Deep Geological Time with Mythic Time in such a way as to demonstrate the richness of fossil traditions both within science and without. I’m not entirely sure what I think it would look like just yet but if I were to incorporate Shaligrams, I would be sure to present them respectful to the contexts of their ritual practices, to emblazon placards with instructions on their interpretive traditions (I can see it now: “How to Read a Shaligram! In Six Easy Steps”), and to link the geological understanding of the tectonic creation of the Himalayas with the stories of sinmo and asuras (demons), Vishnu and Shiva, and the transformation of the goddess Tulsi into the river Gandaki. I would strive to introduce museum goers to the stories of gods and monsters, tectonic plates and dinosaurs, evolution and creation through labels, exhibits, and collection data that are all-at-once scientific, spiritual, and imaginative. And, if nothing else, to preserve all manner of histories; from those told by the ancient peoples who first encountered fossil stones, to the faithful pilgrims who continue the tradition, to the scientists who interpret them now, to the stories told by the stones themselves. After all, what is the Past if not the simmering cauldron from which the present emerges? [i] Lovett, Edward (September 1905). “The Whitby Snake-Ammonite Myth.” Folk-Lore. 16 (3): 333–4. [ii] Skeat, W.W., 1912. ““Snakestones” and stone thunderbolts as subjects for systematic investigation.” Folk-lore, 23: 45-80. Additionally, during the 19th century, it was not uncommon for people to carve images of snake’s heads around the bottom aperture of the ammonite shell so as to better the appearance of a snake in coiled repose. Etter, W. 2015. Early Ideas about Fossil Cephalopods. Swiss Journal of Palaeontology 134:177-186. Monks, N. and P. Palmer. 2002. Ammonites. Natural History Museum, London, London, England. Mychaluk, K. A., A. A. Levinson, and R. L. Hall. 2001. Ammolite: Iridescent Fossilized Ammonite from Southern Alberta, Canada. Gems & Gemology 37: 4-25. Peck, T. R. 2002. Archaeological Recovered Ammonites: Evidence for Long-Term Continuity in Nitsitapii Ritual. Plains Anthropologist 47:147-164. Reeves, B. O. K. 1993. Iniskim: A Sacred Nisitapii Religious Tradition. In Kunaitupii: Coming Together on Native Sacred Sites, Their Sacredness, Conservation, and Interpretation, edited by B. O. K. Reeves and M. A. Kennedy, pp. 194-259. Posted on October 11, 2018 by H. W.
I’m excited to announce that my book manuscript has been accepted and is now officially under contract with Amsterdam University Press for their “New Mobilities in Asia” ethnographic series. Over the next several months I will be revising, editing, and restructuring the work to better fit the book format but you can now look forward to my Shaligram research becoming widely available. Now, however, I have one more hurdle to get over. The title. If anyone has any suggestions for a book title, I would be happy to hear them! But nothing is set in stone just yet. Except for the Shaligrams themselves, that is. Posted on September 11, 2018 by H. W.
The Dadhivamana Shaligram takes its name from the Dadhi Vamana Stotra (Prayer to Vamana) where Vishnu takes the incarnation of Vamana, his fifth avatar, to destroy the pride of the great Asura king Mahabali. Though a demon, Mahabali was a benevolent emperor. But he usurped the Deva kingdom and as such, Vishnu took the form of a young, dwarf, Brahmin boy called Vamana and requested that he be granted three steps of land as measured by his feet. In spite of his guru’s opposition, Mahabali agreed. Vamana then took the gigantic form of Trivikrama and measured all of the three worlds in two steps. When Mahabali offered his head as a third step, Vamana then requested that instead, Mahabali should live forever in Patala (the underworld). In Kerala, devotees believe that Mahabali makes his home-coming during the festival of Thiruvonam and in Karnataka, devotees believe that he visits them every year on the Bali Padyami. In this way, the Dadhivamana Shaligram is often brought out during the celebrations of these festival seasons. This Shaligram is also associated with Vamana’s preference for anointing sacred beings in curd or offering rice mixed with curd where he confers strength to the tongue (so as to speak nothing but the truth) and gives a pleasing odor to the mouth. Small in size with two circular marks (BV). The Dadhivamana Shaligram is usually uneven in overall shape with one or more openings that appear yellowish in color. The body of the Shaligram itself is also usually mottled with yellow or orange infiltrates and is typically grey to dark blue in color. Posted on August 26, 2018 by H. W.
Vaikuntha (the Place of Non-Hindrance), Paramapadam, Vishnupada (Vishnu’s feet), or Param Padam (the Supreme Abode) is the celestial home of Vishnu. In most of the Puranas, and in the majority of Vaishnava traditions, Vaikuntha is located in the direction of the Makara Rashi, a celestial formation which roughly coincides with the constellation of Capricorn. Vishnu’s eye is then said to be located at the South Celestial Pole. Vaikuntha Shaligrams are rare in practice. Oftentimes, the Vishnu Padam Shaligram (See Mahavishnu – Dasavatara Shaligram) takes its place or is identified itself as “Vaikuntha.” In other Shaligram traditions, however, the Vaikuntha Shaligram is identified by its distinctive “two-tiered” structure, where a small, central, spiral can be seen beneath the edge of a larger outer spiral or sunken down beneath the edge of the central shape nodule. Vaikuntha is also “the one who prevents men from straying down the wrong path” (Vikunthah) and the Shaligram itself is often described as a “seat of Vishnu.” For this reason, veneration of this Shaligram is said to bestow blessings of a strong 6th sense, to ensure moksha (liberation) for the devotee, and to protect the devotee from false information, poor teachings, or disreputable gurus. This Shaligram is also said to be especially partial to requests for guidance or safety and, due to its association with the dwelling places of Vishnu, is often taken on pilgrimages or other religious journeys undertaken by the devotee. Blue color, lotus mark, a circular mark, glittering like a gem (G). 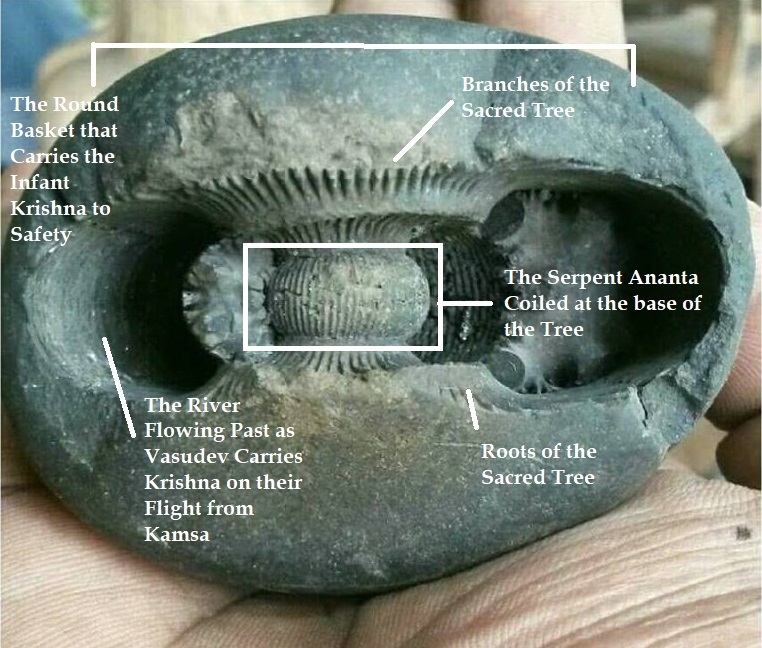 The formation of a Vaikuntha Shaligram typically comes about when the entire or nearly the entire ammonite mold has worn out of the shale nodule, leaving a clear chakra-spiral visible on the internal portion of the stone with an overhanging section still partially covering it. It is also not uncommon for the central portions of these Shaligrams to contain significant iron pyrite deposits, lending the entire spiral a gold coloration. Posted on August 13, 2018 by H. W.
Depending on how long the project takes, this will be a fascinating addendum to my upcoming manuscript on Shaligram pilgrimage and mobility in Mustang. 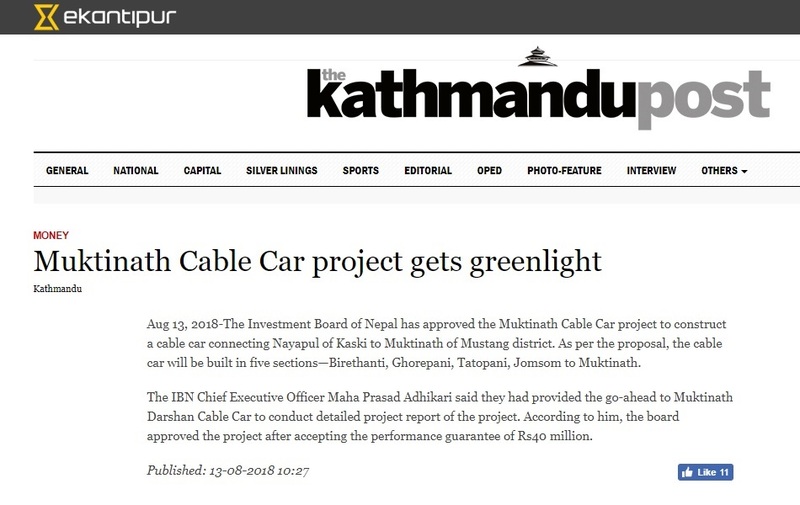 Posted on March 2, 2018 by H. W.
Early one morning, late in the summer of 2016, I awoke just before sunrise and set out for the Kali Gandaki River. Clad in thick canvas pants and a pair of Vibram KSOs (well-suited as they were to walking around in fast-moving, shin-deep, river water), I made it a point to tie my Australian field hat securely to my head with a chinstrap before venturing out into Kagbeni’s lively pre-dawn streets. Since the wind was always threatening to steal the hat every time I turned my head, I figured that the discomfort of a spare bit of leather was a small price to pay against an afternoon burnt red in the glaring Himalayan sun. A mother and daughter in chubas, traditional Tibetan dresses, passed me cautiously, hunched over their hand brooms as they swept the previous day’s goat droppings from the cobblestones and out into the adjacent fields. An older Mustangi man, passing by with his caravan of mules and donkeys laden with rice and kerosene, shouted out a compliment. “Just like cowboys!” he yelled, touching his own imaginary brim. It was a typical morning in Kagbeni, filled with young women chatting on their way to fetch water from the village taps, small children playing in doorways, and the clink of copper cookware banging out breakfast in nearby guesthouse kitchens. I turned west and headed towards the roar of the water. The Kali Gandaki river bed is nearly a quarter mile wide in most places around the village, and as the river slowly meanders back and forth across the valley, breaking up and remerging, undulating from bank to bank over the course of the day, it is continuously revealing a new landscape of stones and silt. 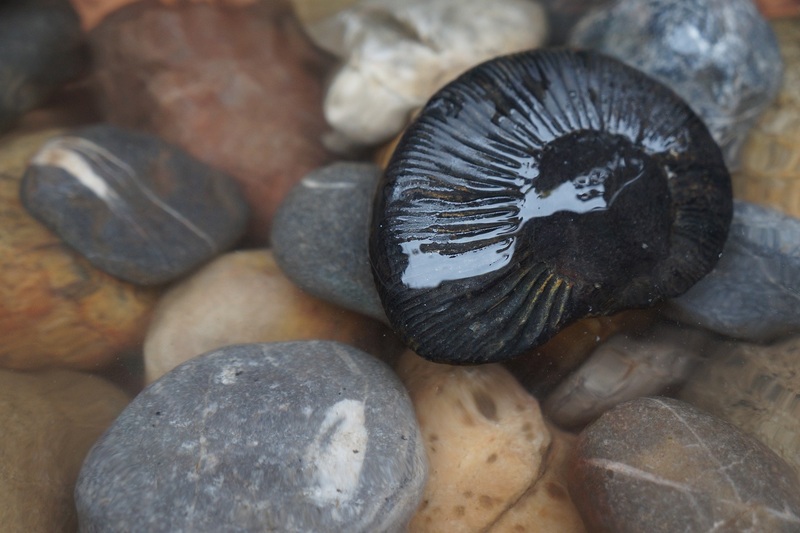 The trick to finding Shaligrams, as one veteran pilgrim once taught me, was to first find one of the many small, shallow, side-streams branching off from the deep central currents. The best streams were the ones in the process of moving off course, easily identified by the tall banks of sediment actively breaking off and sliding down into the water below. Conversely, one could also seek out a stream that had recently petered out in favor of rejoining the main river and walk along its muddy edges slowly up-river, all the while keeping a sharp look-out towards any recently exposed areas. I was familiar with the practice of darśan from my time in India three years earlier. For Hindus, darśan is one of the most important aspects of ritual veneration, especially when it comes to the worship of murti, the sacred images and statues of Hindu deities present in homes and temples. Darśan is a Sanskrit word meaning “to see,” but this aspect of “seeing” does not just mean to see the deity physically. Darśan means to behold the deity as he or she truly is beyond the material form obvious to the eye and in return, to be beheld by the deity yourself. In other words, “seeing” is a form of direct contact between persons (human and divine) mediated by an exchange of gazes in the physical world but not limited to the material bodies involved. It is also a kind of knowing (Eck 1998: 2-5); through sight, both deity and devotee are said to participate in the essence of the other. In the act of darśan, the deity is an agent who “gives darśan” (darśan denā in Hindi), and it is the devotee who “takes darśan” (darśan lenā). In the views of many Hindus, God presents himself to be seen in material form because humans are, by their natures, limited to the use of their senses in order to apprehend the world they live in. Therefore, when a deity is present to offer darśan, devotees arrive to “receive” what is given. What is given then is a kind of physical, bodily, and spiritual, interaction through the medium of the senses. Like the physicality of interacting with holy places, the dhams (the spiritual abode of the deity), the reciprocal gift-giving relationship in the darśan draws on sense experience to construct a concrete, material, appearance of the divine through continuous cycles of relations and obligations exchanged through ritual. Not only does one “see” the deity and be “seen” in turn, one also “touches” the deity with the forehead and hands (sparśa) and is “touched” as well. Devotees may also variously touch the limbs of their own bodies to establish the presence of certain aspects of the deity or to invite the deity’s attention to a particular physical issue or desire for contact. During the darśan devotees also equally “smell” the incense and lotus flower perfumes and “hear” the sacred sounds of the mantras,[ii] the ringing of bells, and the blowing of the conch shell (Eck 1998: 11-12). This “exchange of gazes” is then what enables a subject/object transformation where it often becomes unclear who is acting upon whom and in what capacity. Similar to Nancy Munn’s description of Aboriginal ‘transformations,’ where ancestor spirits produce material objects within which they are in some way embodied (1970), deities in the darśan (Shaligrams included) demonstrate their own dynamic subjectivities in an association with an object world (1970: 143-147) that includes human bodies, ritual objects and other sacra, and landscapes. But Hindu deities are not only consubstantial with the objects they produce or inhabit, they are often described as being no different than them—their mythic presence and their material presence as one and the same thing. This is where the exchange or attribution of viewpoints also becomes possible; where the deities’ desires and actions are open to interpretation, ambiguous, and communally shared. For Shaligrams, darśan constitutes the first vital link merging stone and body as well as between deity and fossil, a link that is initially established beginning with the physical movements and spaces of ritual. Arrangements of darśan altars (deities, deity accessories, miniature animals or people, photographs, sacred stones, etc.) are often carried out with the intention that each piece of the diorama can be connected to sacred texts, local events, household needs, and historical narratives that relate to the place or to the person that the altar currently serves. On an earlier trip to West Bengal, where I was first introduced to Shaligrams at the Radha-Krishna (Sri Sri Radha Madhava) temple in Mayapur, a local brahmacharya (celibate monk) once explained that his favorite stories involving Krishna’s pastimes were any one of the many tales of his days as a young cow-herder. During the middle of the day, when the temple darśan altar was closed and veiled, he said that Krishna would then leave the temple at this time and engage in activities within the village dham, namely that he would re-enact his time as a cow-herder in the nearby goshala, where the sacred cows were kept. The brahmacharya often liked to represent these activities by placing small cow statues at the Krishna deity’s feet before closing the altar. For Shaligram devotees, the altar begins at the Kali Gandaki. The complex mapping of kinship, deity, time, and distance was common among Shaligram practitioners who often described, as this woman did, a Shaligram as being both a manifestation of God (in this case, Krishna Gopala) as well as evidence of the presence of a deceased loved one. The “birth” of a Shaligram from the mountain and the river could be expressed both as a divine birth and as a representation of the devotee’s own birth, the birth of their families, or of specific children. But this layering of time in the context of mythic origin became even more complex within the relationships between Shaligram and devotee where, in the example above, the Shaligram is simultaneously Krishna as an infant in the presence of his mother Yashoda as well as the Hindu woman in the presence of her own mother now deceased. Unsurprisingly, several areas along the banks of the Kali Gandaki river are often used to perform death memorial pujas and more often than not, Shaligrams are incorporated. This begins the bridging of birth and death through the flow of the river which mirrors the bridging of birth and death in the familial genealogy (inheritance) of the Shaligram. In this case, an old Shaligram, passed from mother to daughter, was carried and worshipped by a woman who spent her lifetime as a doting mother to her children. Then, a new Shaligram is born out of the river, which becomes that same deceased mother’s care beyond death, encapsulated in the story of Krishna Gopala. Through the material linking of myth, ritual, and landscape, both the deity and the dead can then be “seen.” This practice of seeing and being seen by the deity (and the dead) is one of the most common, and most important, parts of ritual practice among observant Hindus and is, also, one of the major driving forces behind pilgrimage in Mustang, and throughout South Asia. Searching for Shaligrams is its own kind of darśan. As I walked with particular care not to disturb too much sediment in the water, I noticed two especially important things about the experience I was undertaking. Firstly, the dark, almost inky, black color of a Shaligram is the first thing that tends to catch the seeker’s eye (since it stands out against a mix of silty grey and dirt brown); the second was the subtle appearance of ripples or spirals (the tell-tale ridges of the fossil ammonite shell) along an exposed surface that might indicate that a stone in question was, in fact, Shaligram. But not every stone that might initially appear this way was really Shaligram. Oftentimes, the refraction of light through the flowing water gave the impression of similar patterns on otherwise smooth stones and the accumulation of silt underneath the current was occasionally responsible for the appearance of analogous ridges in the sand that covered the river bed. More than once, a burst of excitement and a quick scoop of water to retrieve a Shaligram appearing in the riverbed would end with nothing more than a handful of sand and a plain rock. Finding a Shaligram often left me with the sense of something truly born from the river, something which was appearing only at the very moment that I happened to see it. Carried down through millennia of time (or 175 million years if we’re going by geological counts) by an ancient and sacred tirtha (a Sanskrit term meaning “bridge/place of crossing/ford”) revealing itself just at that moment and just for me. Something that I was “seeing,” perhaps, that hadn’t been there a moment before. Tirthas often refer to places where the divine world and the physical world are closer together, and it is not unusual for important pilgrimage sites and sacred rivers throughout South Asia to be labeled as tirtha. Later on, I also found tirtha to be an apt concept for describing Shaligrams and Shaligram practices as a whole. In Western discourses, religion and science are often juxtaposed against one another. 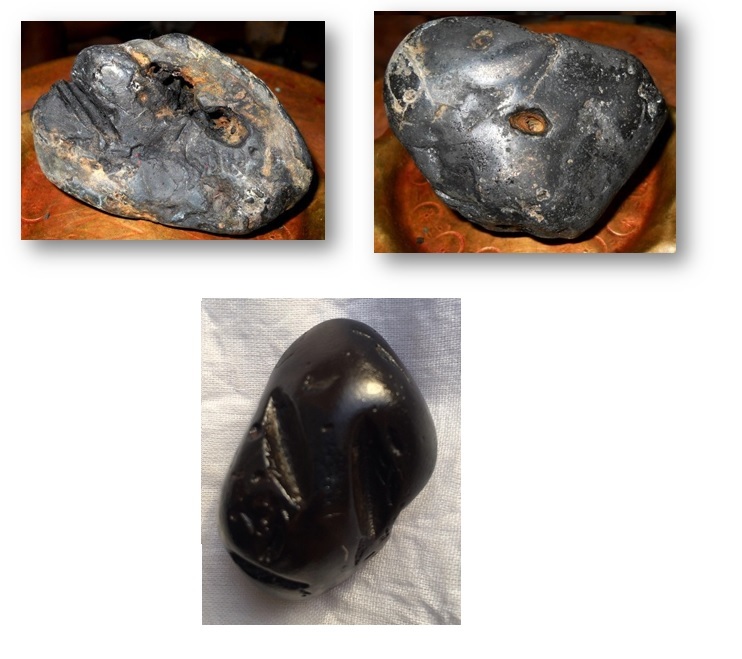 But among Shaligram practitioners, “deity” is equally “fossil,” and “stone” is also “body.” Nor do Shaligram devotees hybridize religion and science, as two possible if unrelated points of view regarding the essential nature of the same object, but instead, use them to draw links between two different ways of knowing. This is to say that, rather than describe a blending of separate, “purer,” forms of knowledge (as one might use syncretism to describe the blending of religious traditions), Shaligram practice demonstrates how Shaligrams as ammonites, Shaligrams as persons, and Shaligrams as deities constitute a shared reality. “Each time I remember Fragment 91 of Heraclitus: ‘You will not go down twice to the same river,’ I admire his dialectic still, because the facility with which we accept the first meaning (‘The river is different’) clandestinely imposes the second one (‘I am different’) and gives us the illusion of having invented it.” – Jorge Luis Borges, “New Refutation of Time,” Other Inquisitions. [ii] The chanting of the mahamantra, for example, requires the repeated chanting of Krishna’s names and constitutes another instance in which one “sense aspect” of God is “no different” than another. Put another way, “seeing” God in the form of the deity is no different than “hearing” his name spoken or as Stephen Knapp explains: “The name Krishna is an avatara or incarnation of Krishna in the form of sound” (2011: pg 30). [iii] In Nepal and India, a death anniversary is known as shraadh. The first death anniversary is called a barsy, from the word baras, meaning year in the Nepali and Hindi languages.